I recently received a book/CD from the OkeeDokee Brothers called Can You Canoe? and it's really great. 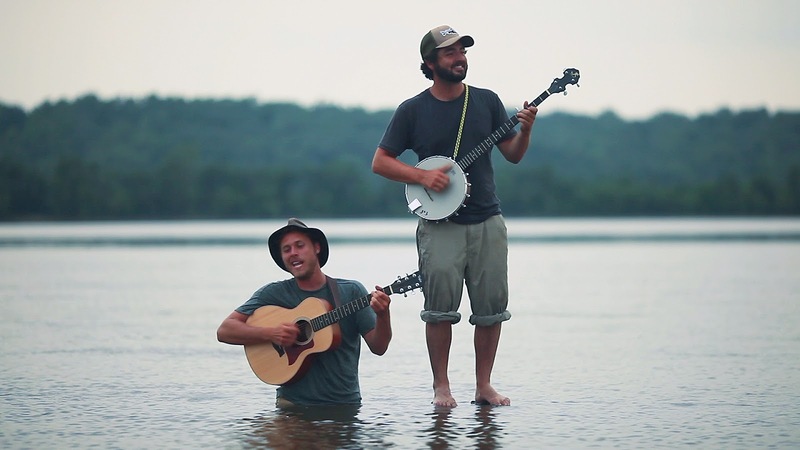 The Okee Dokee Brothers in their natural habitat. The Okee Dokee brothers aren't actually brothers, but they SOUND like brothers, and that's what's important. Two best friends Joe Mailander and Justin Lansing, grew up together in Denver as adventurous kids- they were always rafting, and hiking, and exploring the great outdoors. When they got older they started a bluegrass band together, and travelled some more, and after all their adventures they now live in Minneapolis. Each album they've done is based on an adventure that they went on together. Can You Canoe? is their first album, and it's based on a month-long canoe trip they went on in 2011 that started at the headwaters of the Mississippi river and ended at the St. Louis Gateway Arch. During this adventure, they camped, canoed, sang, danced, made films and videos, and wrote songs all about their experience. The album came out in 2012, and in 2013, the album won the Grammy Award for best Children's Album of the year. Click the image to see on Amazon. But if you don't know the Okee Dokee's work, or you are looking for a great gift to give to a kid who loves music and the outdoors, this is a perfect book for them! They've made movies/videos of their work as well, each one called by the same name as the album. They are available on Netflix, or available for sale on Amazon or Itunes.